Socializing Finance, a blog on the social studies of Finance, recently invited IMTFI Director Bill Maurer and Lana Swartz, the authors of Paid, to write a few posts. This is the second of three series. In our first post in this series, we argued that even if cash is disappearing (which it may not be, at least not completely, and at least not any time soon! ), it’s important to analyze the stuff of money, its material infrastructures and entailments. In this post, we look at one example. In keeping with our museum catalog concept, we’ve selected an example that is particularly difficult to curate. The Automated Clearing House (ACH) is the electronic backbone of the payments system in the United States. It is the network that clears and settles transactions between member banks whenever an employer directly deposits a paycheck into an employee’s account, whenever a mortgage payment or utility bill is automatically deducted, or whenever you use PayPal linked to your bank account to make a payment. It is one of the core systems of the payments industry, the vast, vital yet little understood network of government, corporate and nonprofit entities that helps the money move in physical and digital space. In fact, over the past couple of years there’s been a revolution in how the ACH operates, so that payments can move faster, approaching real time settlement. It’s a big deal but something you probably don’t think about every day, if ever. Imagine you are a museum curator from the future. You have been tasked with creating a gallery about this thing called “money” that people used to use to keep track of debts and to pay taxes to support the common welfare through the institutions of the state. You look into the history records and find that this ACH thing was really, really important: accounting for over 80% of the electronic value transferred in the United States in 2016 (Federal Reserve Payments Study 2016). Now how are you going to curate that? The Atlanta Federal Reserve has tried to imagine how our future curator would capture the ACH. Off to the side of its main money gallery is its slightly tongue in cheek “Museum From the Future of Money”—you are greeted by a large flat screen on which appears a woman in full body unitard who intones the story of how people in the distant past of the 20th and 21st centuries paid for goods and services using different tools and techniques. Slightly tongue in cheek side. 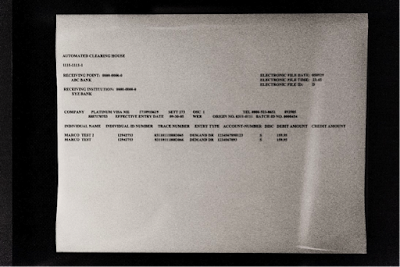 Objects are reverently displayed on black velvet under glass—a coin, a paper check, a credit card… and a laser printed piece of paper illustrating an actual ACH transfer. This object would normally be a piece of sensitive garbage headed for the shredder. Lost to history forever. What does its curation inspire? Fieldwork story: We are at a bar in Las Vegas during Money2020, an annual payments industry conference. We are with a new friend, drinking and debriefing on the day’s presentations of the latest in fintech, developed by financial and payment technology startups as well as the dominant players (Visa, PayPal, but also FirstData, Fiserv and other not-so-household names that operate behind almost all electronic payments). There had been a lot of griping on the day’s panels about the US Federal Reserve’s slowness in embracing fintech, and about the ACH’s slowness in advancing “faster” payments—as close to real-time settlement as possible. Why is the ACH so awesome? As we said, it’s the backbone of payments in the US. Almost all new payment systems use it in one way or another. Federally mandated and majority owned by the Fed, it is managed by a consortium of banks and governed by a not for profit association, NACHA (formerly, the National ACH Association). Is it a public good? It certainly behaves like one. Is it a utility? Hard to say. It’s ubiquitous in the US payments landscape even if it is hidden from view. It’s awesome! One of our hopes in assembling Paid is to shed light on payment infrastructures, their weirdness, their politics, their awesomeness, in all senses of the word. Professor Maurer will be virtually presenting on the "Data and New Technologies" session this coming July 2nd in Basel, Switzerland at the “Money, Debt and New Technologies in Africa” Workshop, organized by the Council for the Development of Social Science Research in Africa (CODESRIA) in collaboration with IMTFI and the Centre for African Studies Basel (CASB). Join the conversation! Click here for program information. Socializing Finance, a blog on the social studies of Finance, recently invited IMTFI Director Bill Maurer and Lana Swartz, the authors of Paid, to write a few posts. This is the first of three series. On 16 November 2016, Prime Minister Narendra Modi made the surprise announcement that all 500 and 1000 rupee notes were being demonetized—they would become worthless paper within 30 days and people had a short window of 50 days (it was later shortened) to exchange their existing notes for new ones. The initially stated purpose was to stifle “black money,” corruption and tax evasion. Over the ensuing weeks, however, Modi spoke more and more of ushering in a digital economy, and digital payment platforms saw a brief uptick in demand for point-of-sale devices. Modi’s move is one example of a growing anti-cash consensus, based on the idea that cash is linked to crime, terrorist financing, money laundering and the like. The Better Than Cash Alliance is a consortium of governments, nonprofits, philanthropic organizations, and corporations all united in the goal of moving the world away from physical cash and coin and toward digital payments. Sweden, ever the vanguard of modernism, is, we’re told, well on its way to a cashless society. we can offer greater financial inclusion to millions. Of course, many readers of this blog already live in a near-cashless state. Our paychecks are automatically deposited; we use credit and debit cards at brick and mortar stores; we shop online with PayPal or send money to friends using Venmo. When we need cash, we have to go to an ATM and get it. Cash is not just there waiting for us to use it the way it might have been when our mothers or grandmothers went to the bank every month to take out a huge wad of bills that they stored in envelopes in the kitchen cabinet next to the flour jar. But is cash actually going away? Maybe, but probably not completely, and certainly not anytime soon. According to the Federal Reserve Bank of San Francisco’s Cash Product Office, cash continues to be the most frequently used payment instrument for American consumers. This is true across a variety of contexts, but especially small value payments. Consider another 20th century digitization dream: “the paperless office.” Many of us work in “paper light” offices, but rare is a workplace with no printers, no filing cabinets, no signs reminding us that the communal fridge will be cleaned out on Friday. A character in Jim Butcher’s 2010 novel Changes compared the paperless office to Bigfoot, “Someone says he knows someone who saw him, but you don’t ever actually see him yourself.” Cash, like many paper technologies, will likely linger. And yet we are seeing an explosion of innovation in the money technology of everyday life. Since 2012, according to the Fed, cash’s share of transactions in 2015 dropped from 40% to 32%. According to that same Fed data, preference for cash as a primary form of payment is declining across all age groups. In our research and from our students, we are always hearing about the fascinating—sometimes terrifying ways—that person-to-person payment apps like Venmo are shaping friendships and romances. Cashless need not be total to have an impact on our everyday lives. With all this talk of cashlessness, we’re often asked about the “dematerialization” of money. What will it be like when all transactions are “frictionless”? But where others may see dematerialization, we see all sorts of new stuff. The world of digital payments depends on vast and variegated infrastructures, many interacting agencies and entities, and material stuff in the form of cables, wires, microchips, servers, air conditioners, boxes of all shapes and sizes full of circuitry, magnets, camera lenses, light-emitting crystals and plasmas, glass, metal and precious elements. What are the cultural meanings and politics of these new technologies? How do they map onto existing social problems and opportunities? How do they create news ones? Witness, for example, this image that circulated on Twitter the aftermath of Modi’s demonetization. Of course, a mobile money system would be happy to see paper bills pulled out of circulation. Does it matter that a private company was now doing the work that cash—a public infrastructure produced by the government—has long performed? In Paid: Tales of Dongles, Checks, and Other Money Stuff, we asked scholars across fields, journalists, practitioners, and other folks interested in the future (and past!) of money to consider the meaning and politics of money stuff. Each chapter is robustly illustrated, like a museum catalog—indeed, the impetus was to imagine a catalog for an exhibition that never took place. We imagined a book about objects that, in their time, might have been considered trivial or trash, things that, once their network had died or their internal gizmos had worn out or their empire collapsed, would have gone to the dust heap of history. Not like the traditional objects of numismatics—gold and silver coins, hoarded, collected, and counterfeited for millennia. But physical things like the magnetic stripe credit card; digital things like the cryptocurrency Dogecoin; ephemeral things like the signature. The e-waste of money. Thinking about money stuff also opened the door to objects you might actually find in a museum, because money stuff is so often about record keeping and accounting. So, you will find point-of-sale devices alongside Inkan khipu, throw-away receipts next to Ben Franklin’s banknotes. This collision of objects creates a wonder cabinet: rather than sparking insight into Creation, we hope it sparks conversations about value, transactions, and transience—even the transience of the dream of a cashless society. In keeping with IMTFI's dissemination efforts and commitment to inclusive conversations and dialogue around the research of money, the institute is pleased to have supported the following video of highlights from the 5-day Learning Event in Abidjan, based on Solène Morvant-Roux, Simon Barrusaud, and Dieudonné Ilboudo’s research project “Cross-border Transfers as a Strategic Tool to Promote the Diffusion of Mobile Money in Rural Areas. The Case of Burkinabe Diaspora Living in Ivory Coast”. For those working on remittances, this video is a significant resource for researchers in academia, industry and policy who want their interventions to be guided by data and perspectives and evidence from people's lives. 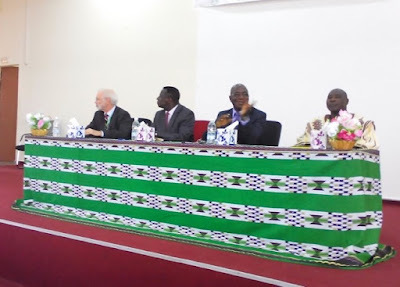 This event, held in October 2016, was funded by the Swiss Academy of Sciences (KFPE) and in collaboration with the University of Geneva, INERA (Ouagadougou), CIRES (Abidjan), and University Felix Houphouët Boigny (Abidjan), bringing together researchers, students, practitioners and policymakers from Burkina Faso, Ivory Coast, and Switzerland to discuss research insights on mobile money and those working on financial, spatial and socio-economic dimensions of migration in the corridor between Burkina Faso and Ivory Coast. 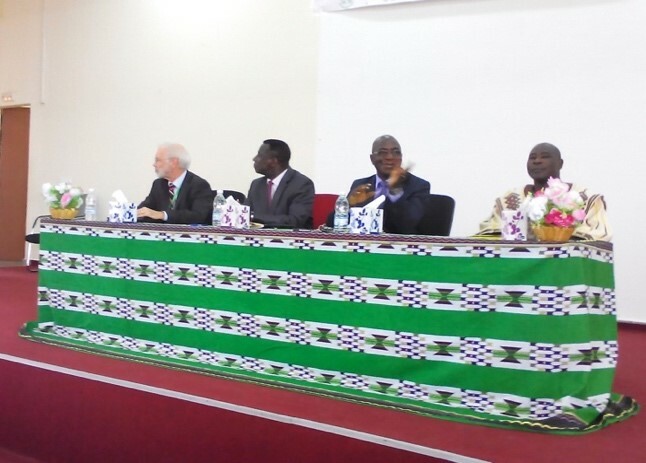 Opening session, University Félix Houphouët Boigny, Abidjan. In addition, the event featured presentations by scholars and researchers from different disciplines, training sessions on research methodologies, and discussions on challenges faced by researchers. These activities and the ensuing conversations were generative for the participants to learn from each other, forge friendships and explore avenues for future collaboration. Audience, side session, CIRES, Abidjan. Some students highlighted the importance of getting methodological training for different research methods (qualitative and quantitative). Others mentioned that some of the results shared during the discussions made them think differently and allowed them to broaden the scope of their own research. An online platform was built to enable the students and researchers to continue interacting and sharing research outputs. "On migration issues we talked about transfer and introduction of new technologies in these money transfer services...At the international level within two countries through a fairly specific migration corridor. I believe this allowed us to shed light and provoke a debate on an old phenomenon which is constantly evolving and multidimensional. It has both economic and social dimensions, and of course, political dimensions. I saw the emergence of interactions between Ivorians and Burkinabese students creating a bond of friendship. The future will tell us what it will give."